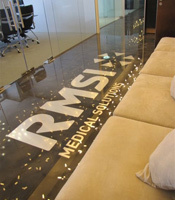 Our Resina (rez-ee-na) decorative floor system provides architects, project managers, interior designers, contractors and clients the opportunity and freedom to create a completely unique, seamless floor. With an unlimited number of colour combinations to choose from, the possibilities are endless. Star Floors has developed the Resina system to be applied as an overlay to both new and exisiting concrete – creating a truly spectacular custom floor. 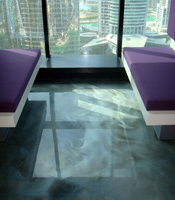 Once restricted by cost and colour options, resin was only suitable for industrial facilities. 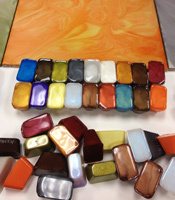 In the last 10 years it has grown as a system and now has far greater versatility in terms of design and color. With reduced costs and a spectrum of colour options, Resina can be used as a decorative finish to create innovative floors that give the designer and client the freedom to create the custom look not possible until now.